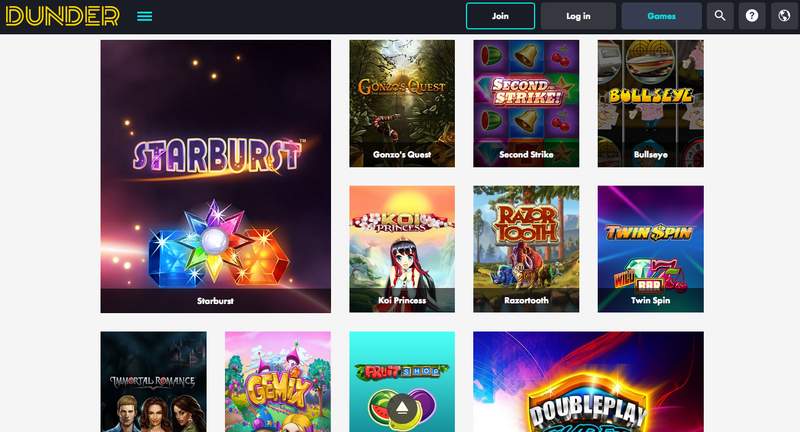 A newbie to the online casino market, Dunder was only launched in 2016, but there is already a buzz occurring around this new site. The reason for this attention is that this site is run by two casino fanatics. The creators of Dunder love the online casino market, but were frustrated by some of the issues they kept facing when playing. So instead of moaning about it, they created their own site, Dunder, with the aim of offering an alternative to these issues. But, despite how highly anticipated an online casino is, it is still entering a highly competitive market and trying to make an impact. How good a job does Dunder do of doing that? To be honest, on first glance, it seems like they do it very well. Every aspect, every single nook and cranny of this site feels like it has been created by players who are trying to create the online casino experience that they have always wanted. But how far does this logic go? does the content back up the tone? If you were wondering whether the aforementioned game options will be enough to make you forget that the promotions pretty much stop after the welcome bonus, well wonder no more, because with in excess of 1000 games to choose from, Dunder offers what may be the biggest selection of games in one place anywhere on the internet! To offer such range, obviously a site has to offer games from a range of providers, and you definitely get that here. Games from NetEnt, Microgaming, Quickspin, Play’n Go, BetSoft, NextGen, Evolution Gaming and many more providers are available here to guarantee that you will never run out of games to play. Whether you are looking for your favourite game, or you are after something new, you are without a doubt going to find it at Dunder. If slots aren’t your think, do not worry for a second, many variations of poker, roulette, blackjack, and others are available, as well as different jackpot games and an excellent live casino. Navigation around this huge selection of games is a lot easier than you’d think as well, with the innovative addition of a very detailed game categories tab, so you can find exactly what you’re looking for amongst the masses of different games to choose from. It is rare, if not unprecedented that a new kid on the block should have such a huge impact on the online casino market, but it seems very likely that Dunder will be the biggest new casino this year, and may even revolutionise the industry!